Looking for a fun and unique way to hang out with your friends? Need a cooking class just for your family or friends? 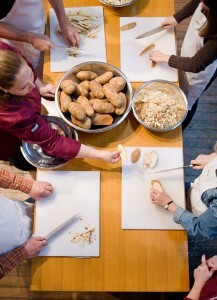 Book a private cooking class for at least 6 people and up to 24 at our awesome hands-on cooking school! Learn new skills, hone the ones you already have, discover a cuisine you’ve been dying to try all in a relaxed environment with skilled professional chef instructors. Any of our classes you see on our class offerings work well for a private event, but we’d be happy to cater an event especially for your needs. Have a specific theme in mind? No problem. We also happily cater to food restrictions. You are welcome to bring your own beer and wine with no corkage fees to any of our events.